Every trip is one to remember with the reliable 2019 Forest River Grey Wolf 22RR! This Travel Trailer Toy Hauler is both comfortable and dashing, and you can find this RV over at Lakeshore RV Center! We have the nation's lowest prices, making us the #1 RV dealer in Michigan! Even if you don't live in Michigan, you can still enjoy our factory-direct prices! We have 24/7 nationwide delivery! So if you're driving to or through Muskegon, stop by our lot at 4500 E Apple Ave Muskegon Michigan 49442! Want more information on this Toy Hauler? Give us a call at 231-788-2040 to talk with one of our RV experts! Towing this Toy Hauler is easy with its hitch weight of 686 lbs, dry weight of 4871 lbs, and GVWR of 7686 lbs. The 15' 0" awning lets you relax under some shade after the long journey! 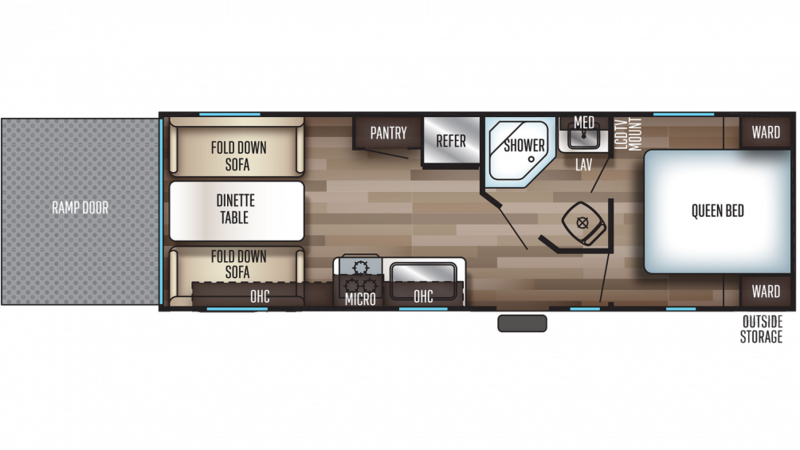 Up to 4 sleep comfortably inside this Travel Trailer Toy Hauler! Get a full night's rest with the master bedroom's Queen bed! Naps come easy with the cozy furniture throughout the Toy Hauler! Outdoor toys are fun for everyone, so you should bring them with you on your vacations! This Toy Hauler has a hefty cargo capacity of 2815 lbs. and a big 12' 9" garage, so you can bring your favorite ATV, kayak, jet ski, or any of your other toys!